Well now honestly, I wish I was one of those bloggers who bombarded you with beautiful images of my life but the truth is that I simply haven’t got time to be staging my daily existence with style, grace and a flutter of my magic wand and so I’m afraid you get what you get with me and what you get with me today is a warts and all look at my bedside table complete with tea mug, wine glass, rumpled bed and discarded cushions. Sorry, not sorry. The reason being that I want to rave about the benefits of owning a bedside basket. Oh yes. 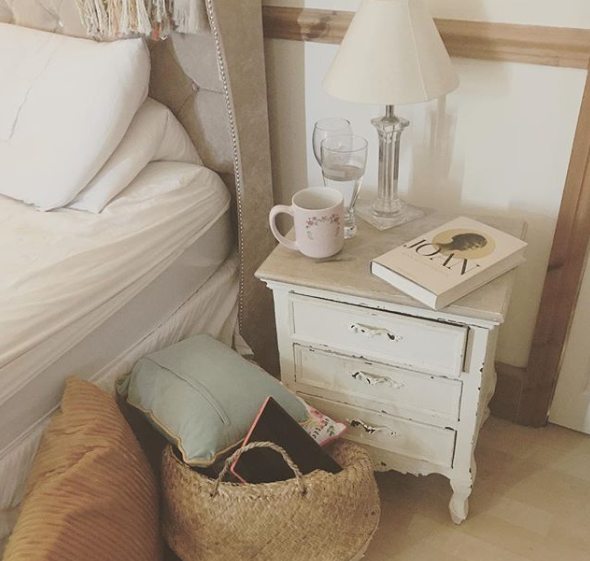 Not content with a bedside table, she who likes books and suffers insomnia and cannot live without her Kindle and needs a stack of cushions to sleep needs more than the surface of her table to survive and must if she is not to skid on a book every time she heads for a midnight visit to the loo, own something that allows her to pretend that clutter is by design. And so I begged my sister for one of the baskets she used to sell and Father Christmas delivered it accordingly and I set about filling it with all the to-be-read books balancing on my bedside along with some bed-socks and a box of violet cremes and an assortment of other odds and ends and hey ho bedside life was somewhat, if not wholly, organised. The only issue? Ste now considers the whole matter to be no longer the subject of much exasperated tutting, but now somewhat portable so that during the “big tidy up” he carried it away and squashed it between wardrobe and chest of drawers and rather defeated the whole object because within the course of one night, books had grown like mushrooms beside my bed and I think you will agree that is serves him right for messing with things that don’t concern him mais oui? Anyways if you too are a bedside clutterer, get a basket. Over and out. P.S: The book on my bedside is Joan by Simon Fenwick and it is a little piece of biographical, bohemian, wartime beauty.